By Sue Morris @ KidLitReviews August 12, 2015 barnyard animals Betty Schwartz Cartwheel Books dinosaurs John Bendall-Brunello Lynn Seresin matching board book My Barnyard! A Read and Play Book! My Dinosaur! A Read and Play Book! 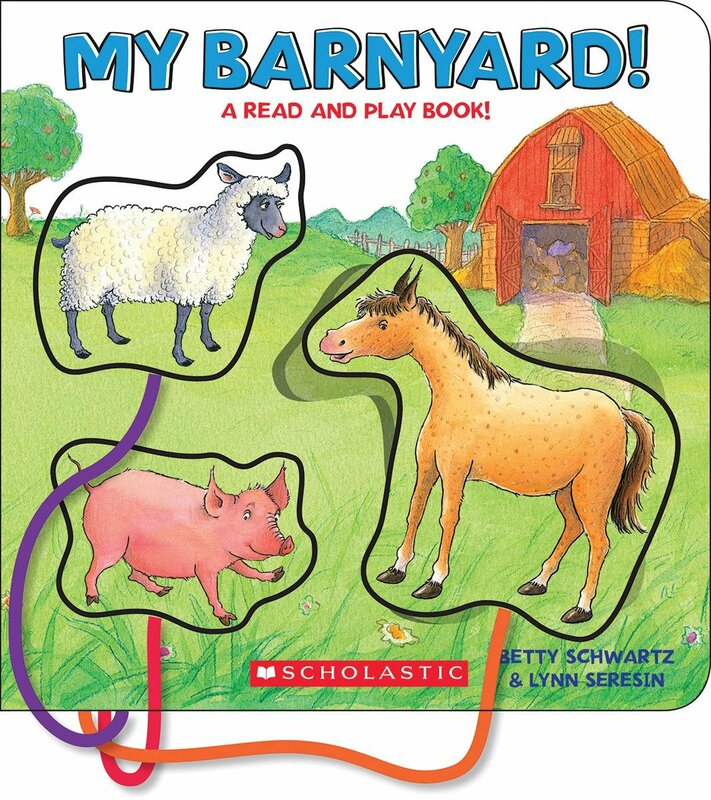 Scholastic Inc.
My Barnyard will be loved by young children who are interested in animals—and what child is not? 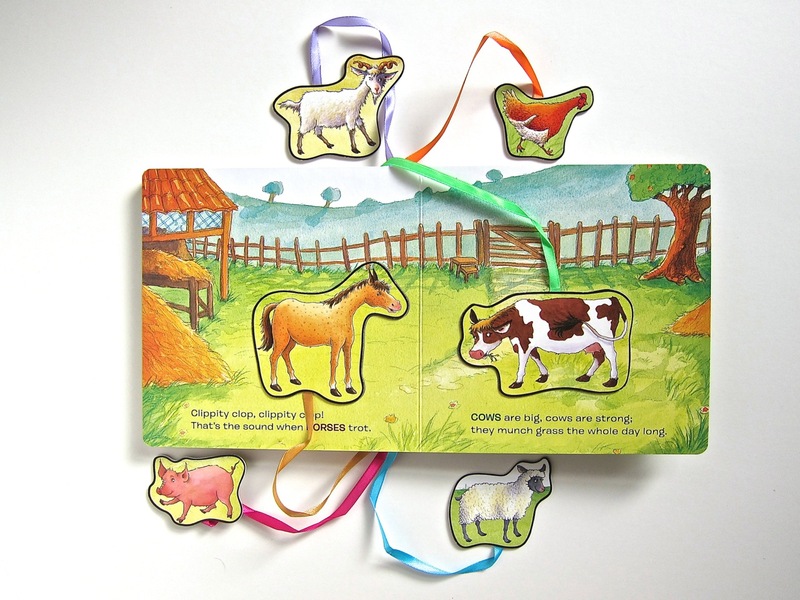 The rhyming text tells the story of each animal’s day, starting with the chickens and the sheep. With their little chicks in tow. SHEEP are fluffy and eat grass. 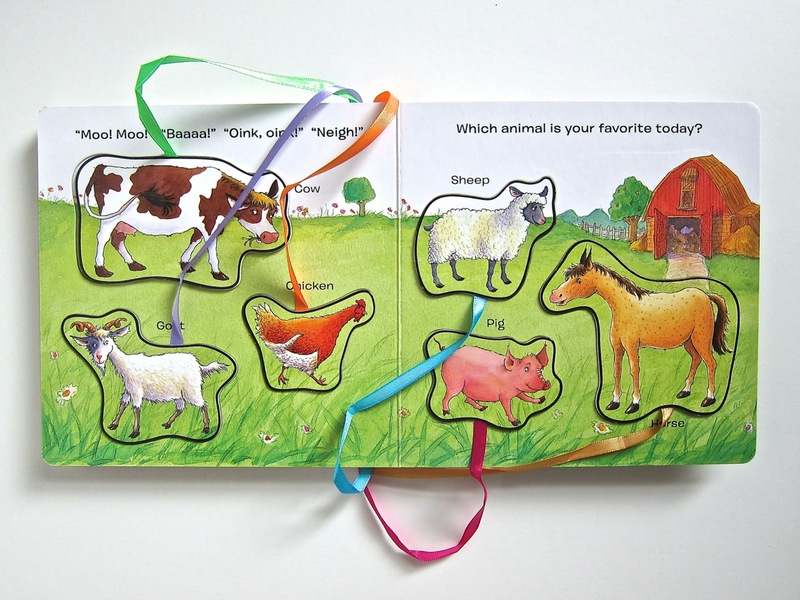 The name of each barnyard animal is capitalized and color-coded to match its cut-out and attached ribbon. I love the color-coded ribbons. What a nice addition to My Barnyard and a thoughtful hint for young children as they match each animal into its corresponding space. At the end of the story, the six animals meet up in the final spread. 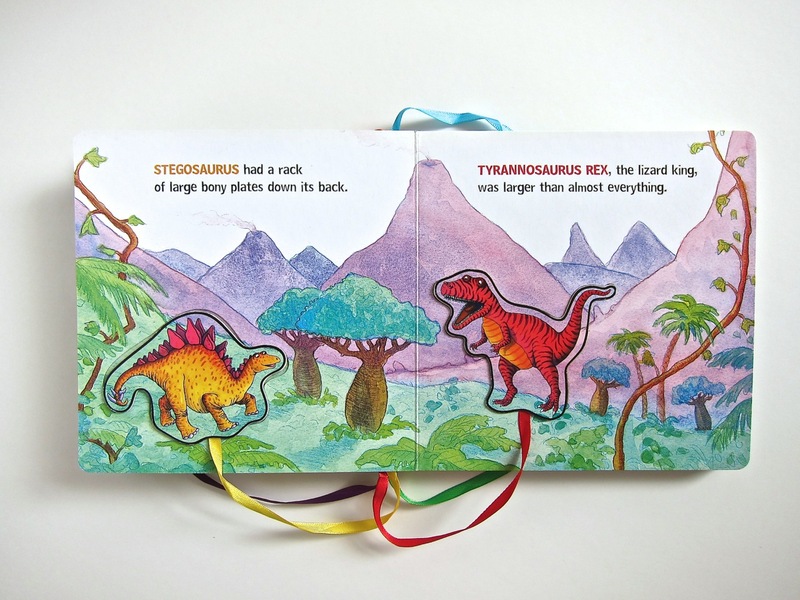 Little fingers will appreciate the colorful cardboard cutouts and the size of the book, which are a perfect fit for little hands. My Barnyard has thick, glossy pages that will stand up to sticky fingers—cleaning off quickly—and rough handling, as young children learn to turn pages. Kids will squeal with delight at the sound of each animal’s call, be it the “baa” of the sheep or the “oink-oink” of the pig. The rhyming text is a joy to read and won’t get on a parent’s “last nerve” when read for the tenth time that morning. Having young children “speak” for the animals will increase the joy of this board book for the youngest of beginning readers. 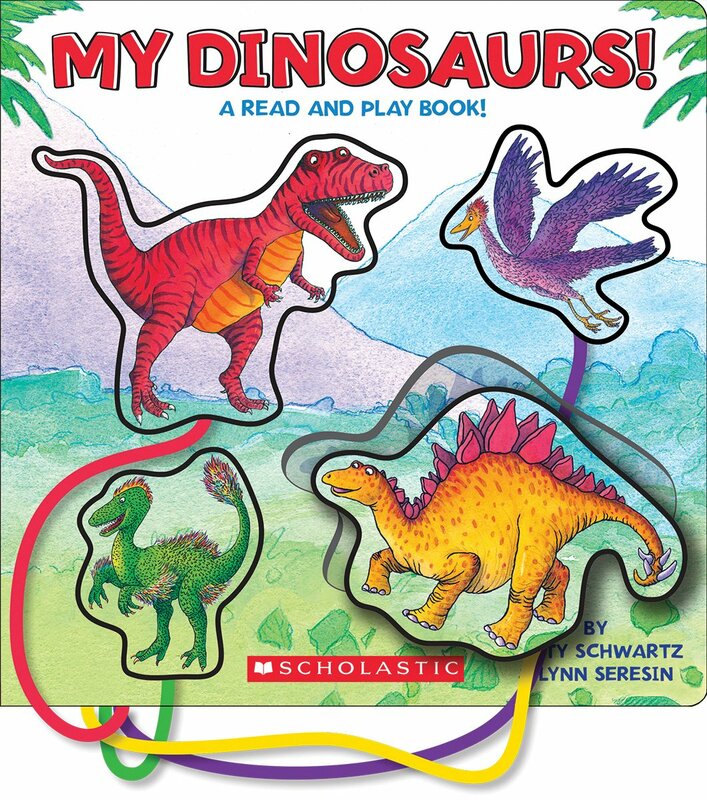 My Barnyard is a perfect complement to My Dinosaurs, the first in this board book in this series by the talented team of Betty Schwartz and Lynn Seresin. 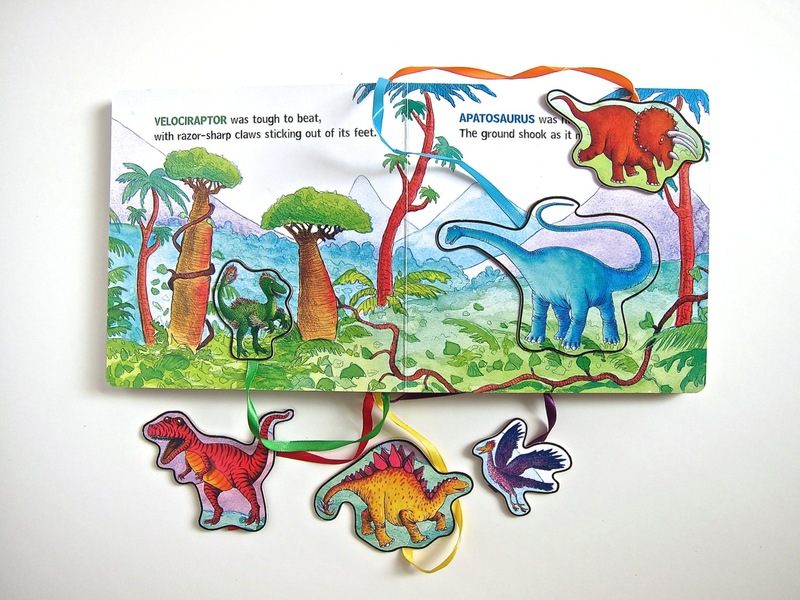 In My Dinosaurs, six different dinosaurs, again with color-coded names and matching ribbons, fit their corresponding cutout spaces nicely. Four of the dinosaurs make-up the cover, just as three of the barnyard animals help make that cover come alive. My Dinosaurs has all the benefits of My Barnyard, as I hope each new book in this series will have. Young boys will especially love My Dinosaurs, but don’t count out the girls. The dinosaurs are realistically brought to life by artist John Bendall-Brunello, who also illustrated My Barnyard. Young children and their parents will love this new Read and Play board book series from Cartwheel Books (an imprint of Scholastic). The books are realistically drawn and offer young children the opportunity to learn about animals as they listen to the stories and then place each animal in its correct environment. The rhyming text is expertly written in each book. Young children will want to go through these books on their own, “reading” the words—from memory or imagination—and having a blast with each turn of the page. MY BARNYARD! A READ AND PLAY BOOK! and MY DINOSAUR! A READ AND PLAY BOOK! Text copyright © 2015 by Betty Schwartz and Lynn Seresin. Illustrations copyright © 2015 by John Bendall-Brunello. Reproduced by permission of the publisher, Cartwheel Books (a Scholastic, Inc. imprint), New York, NY. Purchase My Barnyard! at Amazon —Book Depository—IndieBound Books—Cartwheel Books. Purchase My Dinosaurs! at Amazon —Book Depository—IndieBound Books—Cartwheel Books. Learn more about My Barnyard! HERE. Learn more about My Dinosaurs! HERE. Cartwheel Books is an imprint of Scholastic, Inc.
Hey, stranger. 🙂 Love to see you here. For little kids these are terrific books. Great idea! No lost puzzle pieces. Great review, Sue. What a super cute idea! A puzzle and a book. Brilliant.